ANNOUNCEMENT: X-GEN Version 5.9.3 Now Available! ALSO: Instructions for building X-GEN are now available! 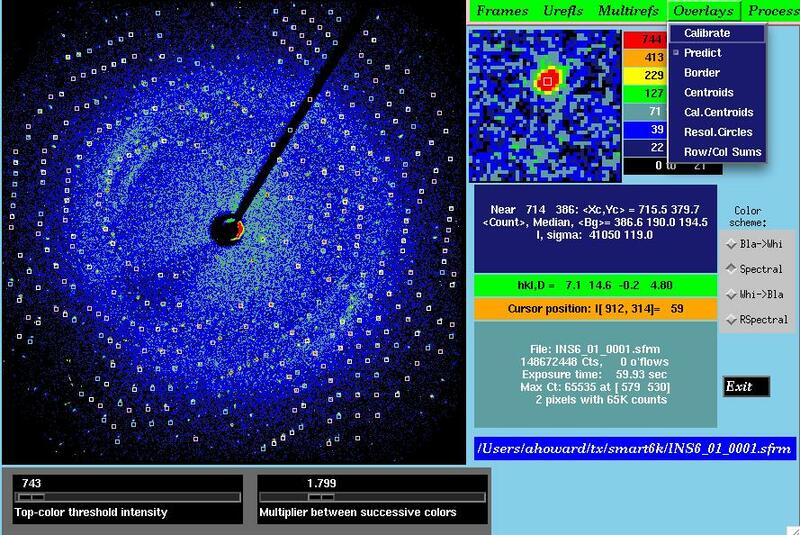 X-GEN is an integrated software package for the processing of diffraction data collected on a wide variety of area detectors. X-GEN is designed primarily for processing macromolecular crystallographic data, but it has been very successfully applied to small-molecule single-crystal data as well. X-GEN is based on Prof. Howard's long-standing XENGEN package, which works specifically on data from Xentronics-style multiwire proportional counter detectors. In the early 1990's he received an NSF Small Business grant to convert this detector-specific software into a form that could be used with other kinds of data. The resulting package, first named POLYDET and, beginning in 1993, X-GEN, continues to provide high-quality processing results for detector data. Prof. Howard is actively involved in development of X-GEN, both in extending its algorithmic reach and in providing new and better user interfaces for the code. Documentation describing changes in X-GEN as of versions 5.1.0, 5.3.1, 5.4.7, and 5.5.5 are available here. The upgrades in 5.2 are described in the 5.3 document. Descriptions of the upgrades in xgen-5.9.3 will be available soon. The X-GEN MULIST format can be converted to MTZ format by a utility already available within CCP4. A broadly functional processing script, xgenproc is now available for download from here or as part of any of the package downloads (below). A description of the process for building X-GEN is now available. An overview of X-GEN's capabilities is available. A simple version is available here. Other documentation may be obtained directly as well or by download (see below). Documentation for X-GEN's file formats is included in these packagings. An appropriate reference for X-GEN is given here and can be downloaded here. A Debian package for X-GEN is under development. Watch this space! Last updated by Andrew Howard on Thursday 15 January 2009.